Explora Technologies assists Institut National d’Optique (INO) in the accomplishment of a world first tech demo: MicroFlow, a revolutionary diagnostic bioanalytic device, for a Space technology demonstration. The flow cytometer has been the standard instrument for examining biological specimens since the 1960s. But it is a costly and complex device that can only be operated by highly qualified professionals in medical and life sciences laboratories. In practice this means delays in processing specimens and longer waits before starting appropriate medical treatment. Moreover, people in many parts of the world don’t have access to flow cytometry—precisely because of the human and material resources required. With its expertise in fiber optics and lasers, support from the Canadian Space Agency (CSA), and the expertise of Explora Technologies in advanced Embedded Systems, INO has designed an instrument with the potential to monitor and diagnose immunological pathologies and important biomarkers/hormones of stress onsite. This device will not only expedite diagnosis, it is also less costly, fully automatic, and portable (about the size of a shoebox). 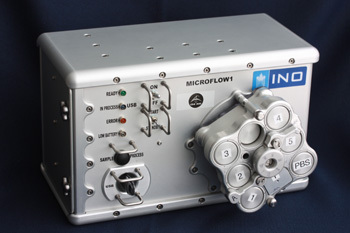 CSA astronaut Chris Hadfield will be the first to use Microflow during his mission on the International Space Station in 2013. Explora Technologies worked in collaboration with INO to develop the electronic and low level software of a platform used as the system’s core. The principal challenges were to develop a solution that met the spatial requirements: very compact, batteries operated and also, a very little thermal dissipation without ventilation possibility. Furthermore, the developed platform must have enough power to accomplish a rapid data acquisition, to control the different components and to offer the computation capacity required by the analysis application for a fast time to result. To be able to meet up all those requirements and in a very tight schedule, Explora developed a solution based on their MX51 Avatar platform, which include an operating system. The device will be the subject of different tests, including simulations in weightlessness environment. It will be delivered to the Canadian Space Agency (CSA) to be operated in the international space Station at the beginning of 2013.